Wat Pho or Po is one of Thailands most famous Temples mainly due to its massage school, entry for farangs is 100baht and includes a free bottle of water, obviously Thais get in for free, 1 hour massage costs 260baht, cheaper just about every where else in Thailand but this place is famous for massage so can and does charge premium prices. Getting to Wat Pho is easy, either get the boat ferry to Tha Chang pier and it is a short walk from there near the Grand Palace, or get one of the following buses, Bus routes 1, 3, 12, 25,44, 47, 53, 60, 82, 91, 501, 508, Wat Po is located on Maharat Road. As you enter Wat Pho you will pass a few stalls selling Thai nik naks, flip flops, caps and other usual stuff a tourist might buy, these Monk statues are about 2 foot high and they want around 2,000baht each for them, the cheeky git also wanted 200baht per photo taken, take the photo, smile and walk away. Of course being Bangkok with all those University students shooting each other it maybe worth the time to buy yourself a nice weapon, the knife and nik nak stall maybe able to help you on this, seems to have a few nice weapons, must have a set of brass knuckle dusters some where in that lot. The Temple grounds have many statues, some are there to protect the grounds from evil spirits and some we would probably learn the reason as to why they are there if we took a tour guide, but are they really that important? As long as the one keeping the evil spirits away works everything should be okay, I suppose, although the place does seem to attract a lot of blind people, a non working eyeball protecting statue perhaps? We shall probably never know. This guy looks like one of the protectors of the realm so to speak. A few statues here not doing a lot, probably a story behind them, although probably long, tedious and completely unconvincing in the world of the farang, do you believe in ghosts? Would make a nice garden decoration I suppose. Weird looking thing is this statue. The reclinin Buddha at Wat Pho is pretty famous and quite a crowd drawer, at 43 meters long it is a pretty big bugger to say the least. All covered in gold leaf so pretty heavy and worth a bit baht wise I should imagine, although the great unwashed paid for all that probably. 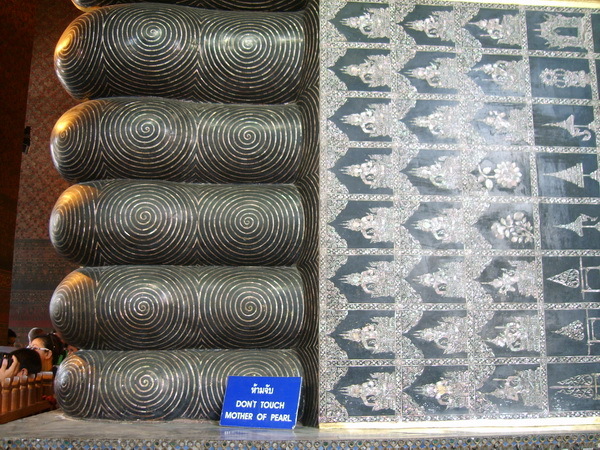 The reclining Buddha has 4.5 meter long feet on it, these have 108 auspicious images on them using inlaid mother of pearl, outside are 108 brass bowls where money and change can be left. Many decorative buildings to get the old camera going. There be bones in those Chedis, the 4 larger chedis contain some of the larger bones from the royal family, many other chedis containing bones of friends of the family, staff etc. This would make a nice entrance for your newly bought council house in Thamesmead, make your house stand out a bit from the rest. Where are the massage ladies I hear you ask, no idea. A nice bell tower at Wat Pho. Excellent post & photos ! ^Really? You obviously spent a lot less time than me in bangkok, 100baht entry into Wat Pho isn't what I would call a rip off, I mean they will charge entry, would 50baht entry make you feel better? Rip-off or not....their original intention was not to be "tourist attractions". Both [Wat Pho & Wat Phra Keaw] are revered and have been around for a couple of centuries. Both also, have the distinction for being King's Wats. Instead of downgrading to passing fancies on the tourist circuit, one might absorb the deeper historic and cultural atmosphere that just is. dirtydog, you do a great job of promoting Thailand, You must love it. I've only been once, for a month and was lucky enough to be introduced to a more respectful side and attitude, by a couple of Aussie expats. I love the place and it ticks me off when I read negative rubbish about Thailand. just follow the signs "Massage"
But, yes, they are not placed in a prominent area but at maximum you need to ask a local to get pointed to the right direction. And not only ladies are massaging, also men. Delighted every time when came here. Well that's the reason we all visit Thailand, it's to visit the temples. All times are GMT +7. The time now is 12:18 PM.